“Healthy Communities is an important part of the work we do as a Nutrition Agent” acknowledges Karen Marie Jones, Nutrition Agent at the LSU AgCenter. The 70121 zip code is her target area, with a community garden beginning phase 2 and work done at Riverdale High school nearby. 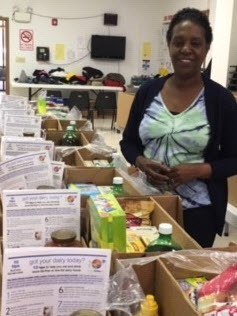 Recently she began including a couple of 10 Tips sheets in the food boxes at the local Community Center in that same Shrewsbury neighborhood. Food sourced from Second Harvest is boxed by the Center manager, Louise and her volunteers and distributed on the second and fourth Tuesdays of the month. Karen also participated in a Health Fair and food distribution down the road at the Jefferson Presbyterian Food Bank on the first Saturday of October. She was not receiving the participation she expected during the Health Fair, so she engaged some youth in a MyPlate game while they waited with their families. The three girls had fun learning about the groups of the MyPlate and reciting the four key messages of the smart bodies cheer. They wanted to help, so they began handing out the Healthy Meals Begin at Home booklets to participants waiting to receive their bag of food. The girls would smile and hand someone the information. Everyone was pleased to get the recipes and information on food safety, enjoying family meals, and shopping wisely. At the end of the Health Fair, Karen filled the bags remaining with booklets and recipes.